Summer Fun Starts with Awesome Accessories! Have tons of fun in the sun! Grab this quality beach gear today. 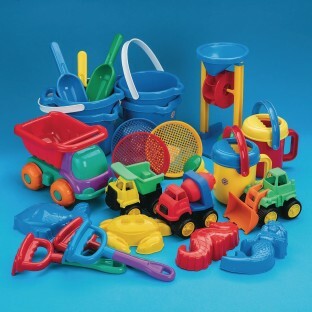 Buckets, shovels and lots of other sand tools! Easy Packs make planning effortless. Have tons of fun in the sun with this quality beach gear. Includes 4 buckets (2 colored, 2 transparent), 3 shovels, 3 rakes, 3 jumbo sand sieves, 2 watering cans, 1 sand and water wheel, 2 haul n’ dump construction toys and 4 sand molds.